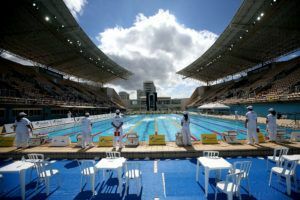 As we previously reported, the CBDA (Brazilian Confederation of Aquatic Sports) has put in place a loose qualifying procedure for Brazil for the World Championships, but nothing definitive. After the pre-meet technical meeting at the Maria Lenk Trophy they announced they’ll automatically add the top-eight FINA point scoring swimmers to the World Championship, and that they have the ability to add more at their discretion. The same system is in place for the Junior World Championships. Swimmers can qualify based on times from either the Maria Lenk Trophy occurring now, or the Brazil Open held back in November. 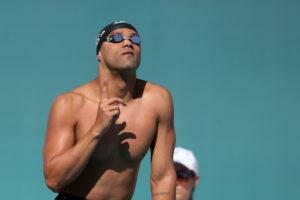 Along with requiring a top-8 point time, the swimmer also needs to be under the FINA ‘A’ standard in order to qualify. The CBDA will be using the 2016 FINA points table, rather than the recent 2017 tables with updated world record swims. After day 1, Alex Pussieldi for Best Swimming has compiled the top-8 scoring swims for both World Championship qualifying and Junior World Championship qualifying. Here’s a look at the top-8 FINA point scoring swims. If the meet ended tonight, these eight would be automatically named to the World Championship team. The World Championships will be held in Budapest in July. 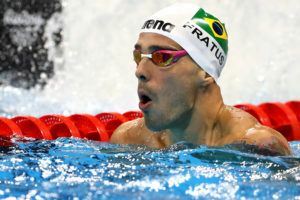 Guilherme Costa, who won the 400 free on night 1, scored 881 points with his swim but wasn’t under the ‘A’ standard of 3:48.15 and therefore is bumped off the list. The swims from Thiago Simon, Brandonn Almeida, Gabriel Santos and Leonardo de Deus were all achieved at the Brazil Open in November. Here’s the current top-8 in line for the Junior World Championships, which will be held in Indianapolis in late August. Swimmers eligible for the meet are girls 14-17 and boys 15-18. Where is Cielo? Is he coming back?